IBM Storage Networking SAN50C-R is an optimized platform for deploying high-performance SAN extension solutions, distributed intelligent fabric services and cost-effective multi-protocol connectivity for both open systems and mainframe environments. 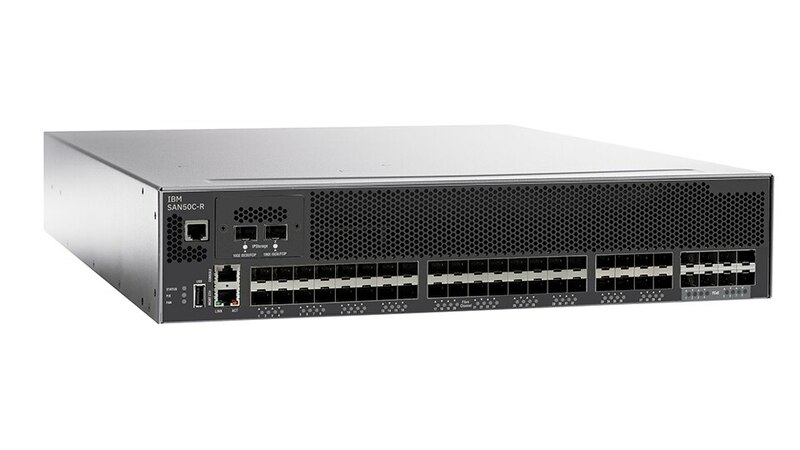 With a compact form factor and advanced capabilities normally available only on director-class switches, SAN50C-R is an ideal solution for departmental and remote branch-office SANs as well as large-scale SANs in conjunction with the IBM Storage Networking SAN384C-6 Director. Enable storage area network (SAN) consolidation with integrated multiprotocol support. Enable cost-effective, high-performing Fibre Channel and Fibre Channel over IP (FCIP) connectivity for open systems and mainframe environments and fast disaster recovery. Leverage support for virtual storage area networks (SANs), which are ideal for efficient, secure SAN consolidation.